As we find ourselves nearing the peak summertime travel season, May 4th is proclaimed International Firefighters’ Day (IFFD). It was instituted after a proposal was sent out across the world on January 4, 1999 due to the deaths of five firefighters in tragic circumstances in a wildfire at Linton in Victoria, Australia. People and families will be travelling across the country visiting National Parks and public lands. As wonderful as this time of year is, the western lands of our country often become dry from lack of rain. The dry conditions expose many of our National Parks to a significant threat of fires started by both Mother Nature and humans. These fires can be so unpredictable, it becomes to nearly impossible to make predictions as to direction, and speed they may take. Firefighters battling these wildfires must make quick decisions despite considerable uncertainty in situations where inaccurate information can lead to more environmental damage and a loss of life and property. The conditions these wildfires produce make it nearly impossible to obtain real-time mapping and awareness, especially at night when it’s too dangerous to fly manned aircraft over the area. Airborne support aircraft are limited to daylight hours; thus reduces ground personnel’s vital real time information on what is happening with the burn at night. 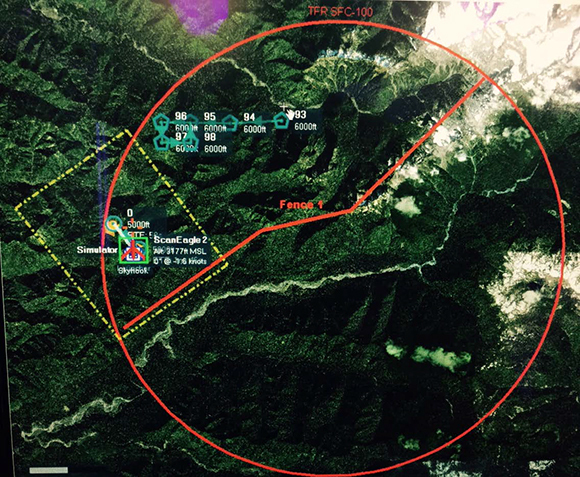 Real time airborne information may include Hotspot location, actual and predicted movement, fire intensity and projected firefighter insertion points. During a wildfire, The Federal Aviation Administration designates the area above and around the wildfire as Temporary Flight Restricted (TFR) airspace and all flight activity is limited to only authorized piloted and unmanned craft. Piloted firefighting aircraft are often deployed to look for hotspots, deliver water drops to those areas, and deliver needed supplies to ground crews. Due to cost, many agencies cannot afford tactical air support and they must rely on other resources to get a view of the fire and its impact. This is where UAS comes into play; UAS operations can provide a complete aerial map of the wildfire, using infrared technology in real time without putting firefighting personnel or manned aircraft in danger. This technology can see through smoke, which blocks human line of sight in manned firefighting reconnaissance aircraft. The data collected from UAS aircraft while flying over a fire can be used to create real-time maps of the fire line, terrain and vegetation. These maps can be sent back to the controlling agency’s fire control and support team, so water and resources can be directed to the area’s most critical land mass to protect and suppress. UAS use in wildfire operations is a very important tool which can aid firefighters on the ground and show a real time picture to both save lives and protect our natural resources.